Australia’s failed drugs policy #2: Are we making progress in drug law reform? In April 2015, after a powerful campaign by medical cannabis activists, polls showed 90% support for legalising medical cannabis. Victoria and Queensland announced they would join New South Wales in taking part in clinical trials for the use of medicinal cannabis. In the two-and-a-half years since, we have witnessed the creation of a medial cannabis regime in Queensland that most medical cannabis users find deeply disappointing. They have seen the institutionalisation of a system that is bureaucratic, convoluted, time-consuming, expensive and patient-unfriendly, while the overwhelming majority of medical cannabis users are still forced to be criminals, sourcing their medicinal cannabis from the black market. Why has drug law reform stalled in Queensland? What is happening with drugs policy in the rest of Australia? 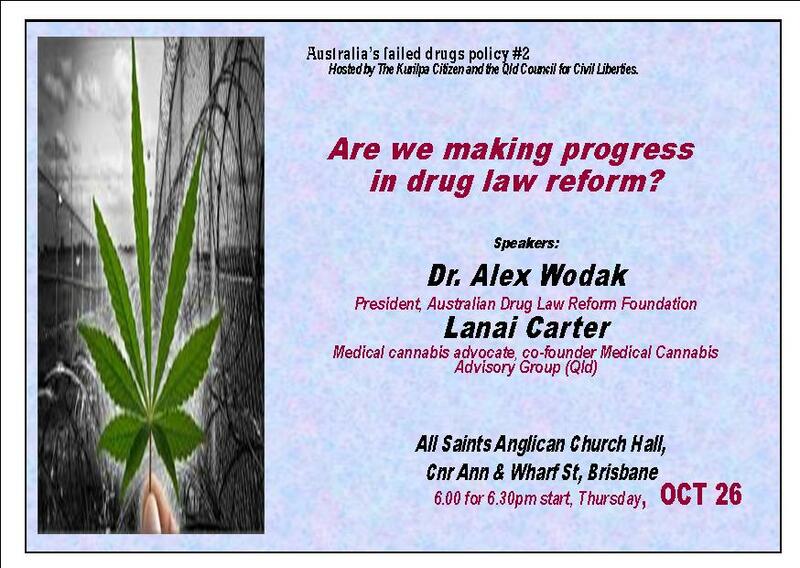 These questions are the subject of the second lecture in the series, Australia’s failed drugs policy, ‘Are we making progress in drug law reform’, at the All Saints Anglican Church hall in Ann Street on Thursday October 26. Providing an overview of the Australian situation will be the President of the Australian Drug Foundation, Dr Alex Wodak. Dr Wodak says: ‘We have won the intellectual debate about the War On Drugs. Now comes the much harder and longer political debate. It’s pretty clear that relying heavily on drug law enforcement has been an expensive way of getting poor results. Now we need to find an affordable way to get good results’. Dr Wodak will look at the whole spectrum of drugs policy reform in Australia including, pill testing, injection rooms, and legislative reform in areas like medical cannabis. Although medicinal cannabis helps relieve distressing symptoms from a range of conditions when conventional medicines haven’t worked, Dr Wodak says so-called ‘legalisation’ has done little to help: ‘The drug is virtually unobtainable lawfully because of multiple bureaucratic obstacles,’ says Dr Wodak. Please come along! How can we help bring change? Have your say!